★ Destroy 18 Seal Stones that have sealedthepower of the Lea goddess and save the Lea continent !! Indie game have created three craftsmen -> SuperCasualRPG! ★This is only one Ppu(plant) widget game inthe world.Sweet GardenPlant happiness in your lives.This is only for Android !! You never see iPhone ! !◎ First, Watch what is Sweet Garden★ Sweet Garden?It’s a completely new style of simulation game where you can raise“Ppu”,the Sweet Garden plant pet, through a widget in real-time.★ You’ve never seen anything like this!- “Ppu”, the pet in Sweet Garden, moves in the widget as if it werealive.Just watching it will make you very happy.▣ Sweet Garden’s Unique Features1. Sweet Garden’s widget allows you to turn the battery widgeton and off,based on the fact that it is operated by the widget.2. “Ppu” talks to the user and each characteristic of “Ppu” isdifferent.▣ How to Install and Play1. Download the game and install.2. Open the game and connect the Sweet Garden server forinformation linkage.3. Add the Sweet Garden widget through the menu in thebackground.4. Plant a new Ppu or the ones in your Storage.5. The Ppu will be planted in the background.6. Touch the Ppu to view the menu for its management.7. By touching the slate under the Ppu, you can access the menuwhere you can see the Storage or plant new Ppu.- For Android devices, the widget must be installed within theinternal memory to properly function.▣ Golden Seeds & Silver Seeds- By taking care of a fully grown Ppu, you can collect Golden andSilver Seeds.1. By going to Sunshine Page with a fully grown Ppu, you have ahigh chance of earning Golden Seeds.2. The fully-grown Ppu needs only half the amount of water asusual, so you can collect seeds with without giving much water.3. A fully-grown Ppu will be resistant to diseases, which meansit’ll get sick less often.Water Combo? – Earn tons of seeds with this combo system.When you perform a water combo, you get a grade of SUCCESS orPERFECT and can collect additional Silver Seeds.★ Free download and installation of Sweet Garden but, in somecases, items can be purchased for a fee. ★레아 여신의 힘을 봉인한 18개 봉인석을 파괴해 레아대륙을 구원해주세요! !★8단 성장 몬스터를 키워서 전략적 덱을짜보자!< 엘몬스터 !? 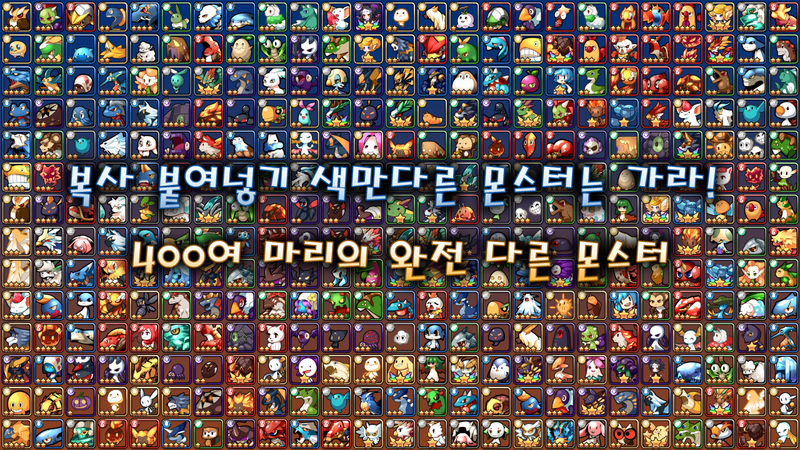 >인디게임의 장인 정신으로 3명이서 -> 캐쥬얼 RPG 를 만들었습니다 !●모든 몬스터들은 각각 다른 개성 적인 말들을 적제적소에 다양하게 합니다.● 모든 몬스터들의 비쥬얼은 못생겼기도 하지만전부다 유니크 합니다. (색만 바꾸고 복사만 한 게임이 아닙니다)● 몬스터의 기본공격을 제외한 스킬들은 매우 유니크합니다.● 끝없이 성장하는 매우 다단계의 성장 시스템을 가지고 있습니다. → 1성 → 환생진화 → 2성 → 3성 → 4성→ 환생진화 → 5성 → 6성 → 7성 → 초월 → 궁극진화 (궁극진화는 추후 업데이트)★ 전투 시스템 - 잔잔한 듯폭풍 전략적인 유니크한 전투 전략 시스템을 가지고 있습니다. → 아래쪽에 좀더 자세히 설명드리겠습니다.1. 일반적인RPG 게임에 있는 거의 모든 시스템을 차곡차곡 잘 담아두었습니다.- 정말 짜임새 있게 만들기 위해 차곡차곡 한땀한땀만들었습니다. ( 해보시면 압니당! )2. 복사 붙여넣기 색만 바꾼 몬스터가 없습니다. 전부다 하나하나 못생겨도 개성과정성을 들여서 만들었습니다.< 유니크한 전투 시스템 >엘몬스터의 전투 전략은 매우 심플함을 강조하면서매우고도로 복잡하고 치명적으로 전략을 구상 할 수 있도록 많은 고심을 하였습니다.● 1. 인장 콤비네이션 시스템 : 엘몬들은스킬에 인장 연계기 옵션이 있는데요예) 바람 엘몬의 "공기폭발" 이라는 스킬이 있다고 하면, 그냥 사용시 "공기폭발"데미지 100 ! 이지만 불 몬스터가 공격한 적을 공격하면 "불의 인장 연계기"가 발동하며 -> "대기폭발" 데미지1000 ! 이 폭발하는 것 입니다.예) 어둠 엘몬인 서큐버스의 매혹이 그냥 사용하면 그냥 공격스킬이지만 불의 몬스터가이전에 공격하여 "불의 인장"을 붙여놓으면 -> 매혹스킬의 연계기 옵션으로 마음속에 불을 질러 우리편이되어버립니다!● 2. 직업이 없다 -> 탱 / 딜 / 힐의 기본적인 조합에서 벗어나지 못하는 현재 RPG 게임과는달리 모든 몬스터는 같은 몬스터라고해도 스텟 변형으로 플레이어 마음대로 커스터마이징이 가능하고, 가지고 있는 스킬중무엇을 주력으로 하느냐에 따라 플레이어가 전략적으로 사용할 수 있습니다.● 3. 스텟간 상성 : 엘몬들은 힘/건강/지능의3대 스텟이 있으면 이 스텟간에는 상성이란 것이 존재 합니다. ◆ 힘이 높은 몬스터는 건강이 높은 몬스터에게 유리하며-> 극단 적인 힘으로 단단한 바위를 부신다 ◆ 건강이 높은 몬스터는 지능이 높은 몬스터에게 유리하고 ->우직함으로 간교함을 내리 누른다 ◆ 지능이 높은 몬스터는 힘이 높은 몬스터에게 유리합니다 -> 지혜로 강함을이긴다이런 스텟간 상성도 전략적으로 매우 중요합니다.< 추가적인 기본 전투 시스템 >● 1. 원소 속성 전략: 기본적으로 불, 물, 땅, 바람, 빛, 어둠 6대 속성을 가지며 (추후에 중간 속성인 전기같은것들도 나올 수있습니다) 이 기본속성들간의 속성 상성 전략을 깔아 두었습니다.● 2. 정령석 전략 : 현재 엘몬에는 장비 시스템 대신정령석이라는 것을 장착해 몬스터의 스텟을 올리고 불리한 상성에대해 정령석의 속성 전략으로 전투를 유리하게 이끌어 갈 수있습니다. (불의 정령석을 장착한 몬스터는 바람몬스터에게 추가 데미지를 줍니다)[필수권한]● 주소록엑세스허용-로그인과정에서 사용자의 구글 계정을 확인하기 위해 이 권한이 필요합니다.-[주소록엑세스]권한에 이 내용이 포함되어 있으며,해당 권한이 없을 때 구글로그인을 할 수 없게 됩니다.----개발자 연락처 :+82536230455Pleasedestroy the 18 bonginseok sealed the power of the goddess to saveLea Lea ★ continent!8 ★ kiwoseo growth Monsters Let's weave thestrategic deck!Three people in the craftsmanship of indie games-> created a casual RPG!● All monsters are unique to eachvariety of other horse in place restrictions apply.● The visualsare not saenggyeotgi of all the monsters, but's itunique. 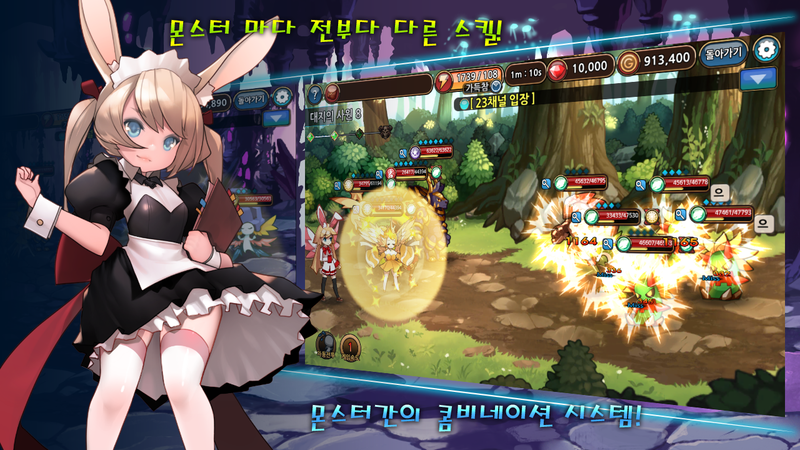 (This does not change color only one gameonly copy)● skills except basic attack of monsters are veryunique.● we have a very multi-level system of endless growth forgrowth. → 1star → reincarnation EvolutionCastle → 2 → 3 → 4 Castle St. →reincarnation Evolution Castle → 5 → 6 → 7 CastleSt. →transcend → ultimate evolution(evolution is the ultimate future updates)★ battle system - thestorm seemed to have a unique strategic battle system, calmingstrategy. → I will explain in moredetail at the bottom.1. chagok well placed chagok put almost allthe systems in a common RPG games.- I really chagok made chagokstitch to stitch Making textures. (Nidang pressure if you type! )2.No copy and paste change color only monsters. Even if there's allone can not spend a unique one made with sincerity.El monsterbattle strategy, while highlighting the very simplicityVery highlycomplex and has a lot of soul to be fatal to envision strategies.●1. 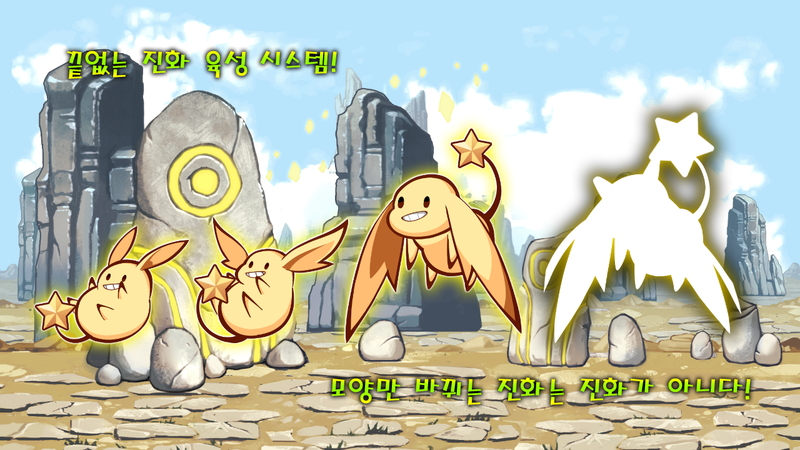 Tension Combination System: elmon are the options I have atensile yeongyegi skillsExample) that there is a skill called "airblast" of wind elmon, Just use "air blast"Damage 100! 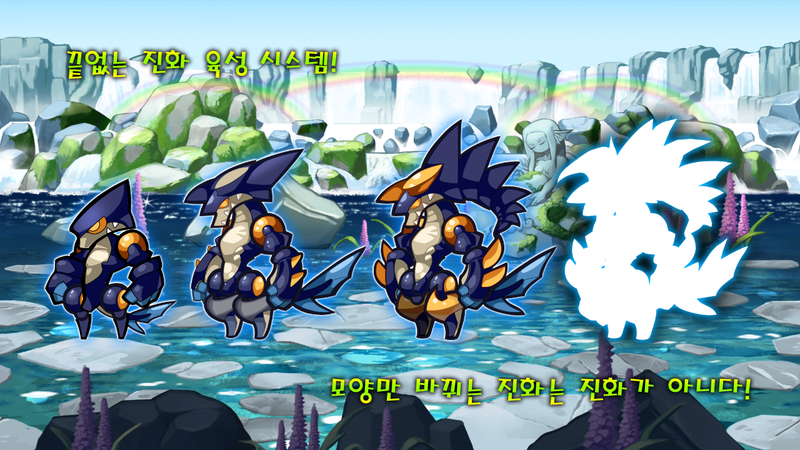 as If the enemy attacks amonster attack triggered a fire, "fire yeongyegi tension"and -> "explosive atmosphere" Damage1000! This is to explode.Example) Using the darkness of elmon asuccubus just fascinating, but just attackingskills When release the fire monsters andpaste the "injustice tension" prior to theattack -> it becomes the barns on ourside the fire in the heart of the enchanting skill in yeongyegioptions!Unlike the current RPG game> it does not deviate fromthe basic combination of tank / dill / Hill - ● 2. There is nojob Even though all the monsters and monsters as playerscan customize at will in the statmodification, Depending on what you have to focus on theskill of the player can be used strategically.● 3. decompensatedliver stats: elmon are that resistance is present between the statif you have three stats strength / health / intelligence. ◆high-strength glass monsters and monsters to high health -> Theadrenal solid rock with extreme force ◆ Monster High healthand is beneficial to high intelligence monster -> press down thecunning to woojikham ◆ highly intelligent monster will forcethe glass to the Monster High> wins strength withwisdomResistance between these stats also very importantstrategically.● 1. Elemental property strategy: basically have afire, water, earth, wind, light, darkness, 6property (Thingscan come out of the middle of the electrical properties at a laterdate) I'velaid the developable property strategy among the basic attributes.●2. 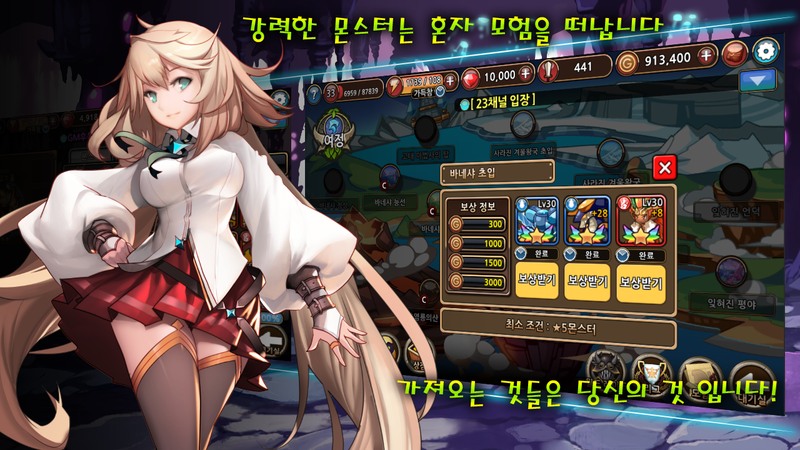 Elemental Stone strategy: You can go now elmon has led the fightin favor of the Elemental Stone property strategy for raising thestats of monsters, attach that instead of Elemental Stone EquipmentSystems adverse resistance. (Monster equipped with a Fire ElementalStone gives additional damage to the wind monster)RequiredPermissions● Address Book Access Allowed- You need this permissionin order to verify your Google account in the login process.-[Address Book Access] and include this information in theauthority, you will not be able to sign in to Google when you donot have that privilege. ★ Destroy 18 Seal Stones that have sealedthepower of the Lea goddess and save the Lea continent ! !Indie game have created three craftsmen -> SuperCasualRPG!